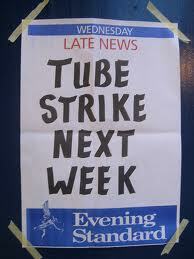 On Wednesday 11, 000 tube workers went on a 24 hour strike. Workers walked out on Tuesday night in protest at plans to axe 800 mainly ticket office jobs, which they say will threaten safety. Wednesday evening I’d been to the student bar, and the night ended far too soon for my liking. On a 3am dash to the corner shop for a bottle of vino, I had to walk through Northwick Park station. I came across a group of tube workers all in their TFL uniforms drinking out of plastic cups and shivering in the early morning frost. From being very young I have been to strikes, the main one I remember being the Magnet strike in Darlington. I remember waving my tiny fist at the people who crossed the picket line, as I screamed “SCAAAAAB!! !”, not quite knowing why I was screaming it but knowing that they were the baddies and we were the goodies. This seemed like a familiar scene to me, and I decided to go with my moral sense of right. After popping to the shop and buying the vino I insisted my friend put it in her bag, because I rather drunkenly decided it would look awful walking past the workers back into my halls with a bottle of wine, having fun, whilst these men were fighting for their jobs. So I decided to join them. I told them that they were doing the right thing, and they offered me a TFL jacket to stay warm. I was slightly confused by the general snigger, but more oblivious after a few vodka’s. Anyway, after standing there for a little while it became blatantly obvious they were in fact on their break, and were waiting to go back to do their engineering work. Their strike had finished at 9pm the evening before. At times like this, there are so many jobs at risk we should all support each other. You never know when it may be you who needs that support. TFL plans a fourth strike for 28 November but union leaders have said they have no plans to disrupt services over Christmas and the new year. hahahahahha they were on their break, you chump! i know that isnt the point of this blog, but ahahaha they were on their break! p.s very shocked to find out disney = fascist… i knew there was a subliminal message in my mind as to why id never bought into the whole disney malarky.